​The first year of school is an important one for both you and your child. It is a huge transition year for most. Communication will be the key to the success of your child this year. Please do not hesitate to ask us anything! What is Early Blended Multiage? We are a blended PreK/Kindergarten classroom. 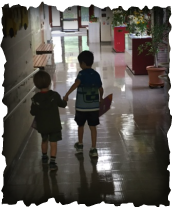 Our four, five, and six year olds learn side by side, in a caring, child-centered environment. The students help to build a strong sense of community and learn through hands-on activities, workshops and small group centers. Our program is based on the Region 6 Curriculum, the Common Core State Standards, and the CT Early Learning Developmental Standards. We LOVE it!!!!!!!!! ​Click on the umbrella below to find out what is happening this month!!! We are having fun and learning so much!!! In our classroom we have "Umbrella Goals". These are wide ranging objectives that encompass many smaller, individualized goals. Our blended classroom is made up of both Pre-K and Kindergarten students, working, learning and playing together. We use these objectives as a guide during our whole group, small group and individualized instruction, as well as our purposeful play. Click on the big school bus to watch the All-Star Transportation Kindergarten Bus Orientation video with your child!